Increasing your I/O performance and efficiency while keeping costs down, a sought after solution for I/O applications is here! Coolgear’s PCI bus expansion peripherals are lending support to systems with and without existing PCI bus capabilities. We’re overcoming limitations for lab, warehouse, industry and more. Coolgear Inc., a versatile computer peripheral manufacturer and seller of computer related components and add-ons announce their new PCI Expansion Boxes for 2016. In the later part of 2015, the computer peripherals company started development of a new core product that expands the computer’s PCI bus platform in desktop, micro PC, laptop, and workstation systems. The PCI Expansion Box was developed as a way to expand I/O performance across the board. Exceeding performance expectations, testing has shown support for virtually any PCI or PCIe application supported by the system OS drivers. Imagine running out of PCI slots in an I/O performance heavy system, or purchasing a new system that doesn’t support an LPT interface or serial communication! The PCI Expansion Box is an inexpensive peripheral device that allows the user to manage additional I/O support for their current system through PCI expansion. Lab environments, warehouse, or other establishments that are running off of a Micro PC, Tower PC, or laptop, your PCI support from your own system may be running out! The PCI expansion box solves the I/O limitations of available PCI slots, it also provides a solution for adding USB ports, and serial communication through PCI and all you need is the PCI cards to install into the expansion box. 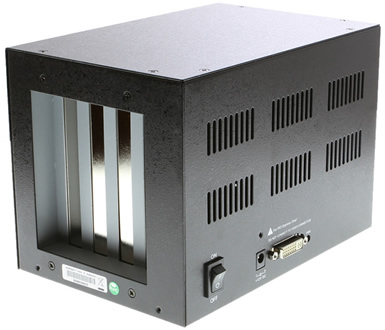 With no handles to turn, and certainly nothing popping out, Coolgear has implemented several “PCI in the Box” expansion models to accommodate desktop, laptop, workstation, and server either by PCI card or ExpressCard connections. Models include a variety of PCIe to PCI and 34mm ExpressCard to PCI for exemplary I/O functionality. Supports 1-lane data transmission at 2.5GB/s. PCI slots are fully PCI Bus Rev. 2.3 Compliant. Supports both 5V and 3.3V PCI Add-in Cards. Whether you are using the ExpressCard or PCIe host card, the expansion box advantages are major! It can support any PCI application integration that you might use in your own internal system’s PCI bus. Expanding serial RS232 communication through PCI, PCI to Audio, and PCI to USB can be used to make a more efficiently used system particularly when a mini desktop may be used. Coolgear promotes the need for a PCI expansion box (I/O expansion) because many computer systems today, especially new systems that are manufactured in 2015/16, are limited or without I/O and vary in the amount of available USB ports, particularly in laptops. When working in an I/O heavy industry, testing and communication is done via serial connections or data transfer through USB, Coolgear finds that continuous port swapping occurs to accomplish particular tasks in industry. This peripheral solution provides a great way to manage time, and create a more efficient use of computer resources. PCI Expansion BoxDesigned to expand PCI and PCIe slots from the PCI Express card slot of your Desktop, Workstation, or Server.